Studio Line: MGM - Scaling the cliffs of insanity, Battling rodents of unusual size, Facing torture in the pit of despair. A fantastical escape into a world of swashbuckling swordsmen and gallant heroes, The Princess Bride is extraordinary entertainment for the whole family. Filled with "romanticism, adventure and a liberal shot of humor" (People), this innovative film from producer/director Rob Reiner and Academy Award-winning screenwriter William Goldman stars Cary Elwes, Robin Wright and Mandy Patinkin. Featuring brilliant cameo appearances by Peter Falk, Billy Crystal and more, and boasting "wonderful scenes and character vignettes" (Leonard Maltin), this lovable film is a fantasy everyone will adore! 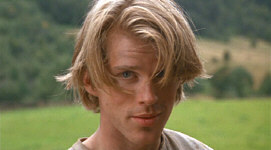 When Westley (Elwes) leaves to seek his fortune, his true love, Buttercup (Wright), is captured by an evil prince. Will Westley return in time to save her? Can he battle the wizards, warriors and pirates set in his way? You'll find out in this "wonderfully inventive" (Los Angeles Times) film for all ages! Awards: Nominated for Best Song-"Storybook Love". DVD: Widescreen 1.85:1, standard 1.33:1; audio English DD 5.1, Spanish Digital Mono; subtitles Spanish, French; closed-captioned; double side - single layer; 28 chapters; rated PG; $19.98; street date 7/18/00. Supplements: Original Theatrical Trailer; Collectible Booklet. 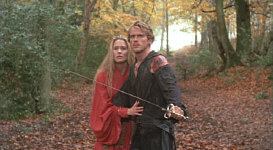 For me, The Princess Bride always fell into that category of movies I wanted see but just never got around to viewing. It didn't exactly set the world on fire during its theatrical run in 1987; as I recall, both reviews and business were fairly tepid. 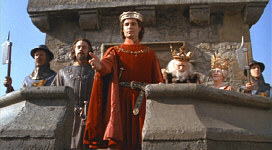 However, the film's reputation has grown immeasurably since that time, and it now seems to be something of a classic of the genre. The DVD certainly was eagerly anticipated by many people, so the time appeared ripe for me to check out this little fable. Based on my first viewing, I'd agree that TPB is an entertaining movie, though I'm not sure it deserves its stellar reputation. It certainly was charming and fun and clever, but I don't know if I'd call it "great". Of course, this isn't the first time I've been underwhelmed by a film directed by Rob Reiner. Some of his movies aren't very good, and no number of repeated viewings will make them better. However, the case of This Is Spinal Tap remains etched in my mind, even though it's been 16 years since I first saw it. When I first watched TIST, I didn't think much of it. It offered a few laughs, but that was about it. Nonetheless, I took it in again when it hit video, and found my interest increasing. Eventually, TIST would become one of my absolute favorite movies; I consider it possibly the funniest film ever made. I honestly doubt The Princess Bride has that kind of potential, but I'd still give it a positive rating. It tells a pretty typical fairytale plot, with lovers who are separated and all the fantastic efforts our hero has to make to regain his lady, but it offers some whimsical twists on the genre that makes it distinct. Not tremendously distinct, mind you, as the film often reminded me of pictures like Time Bandits, though TPB is much less pointed and edgy than that movie. Still, similarities exist in that both take a slightly tongue in cheek viewpoint of their fantasy origins. In the case of TPB, however, the action tries less to be wicked and more to be magical. To a degree, it succeeds. I can't say I was "swept away" by the story, but I found it entertaining. Reiner manages to move it along at a decent pace and keep the film balanced; none of the varying elements - whether adventure, romance, or comedy - ever dominate to the exclusion of the others. The fantasy story is framed by shots of an old dude (Peter Falk) reading the tale to his grandson (Fred Savage). That device could have become tiresome and cloying, and while I honestly could have lived without it, I found it worked acceptably well. One of the more pleasant surprises I took from TPB related to the quality of the performances - most were quite good. Cary Elwes made a terrifically dashing hero, a factor his work has lost over the years as he's turned into something of a schlub. Chris Sarandon and Christopher Guest both are fine as our conniving villains, and Mandy Patinkin was almost a revelation as Inigo Montoya; I've absolutely loathed Patinkin for years, but he seemed absolutely fantastic in this role. His performance was witty, thrilling and poignant, and you just don't know how much I hate to admit that about something Patinkin did. But I have to acknowledge it: he's the best thing about this movie. The above-cited actors got the spirit of the piece right; they combined earnestness with the correct measure of campiness. Patinkin's acting seemed to channel Father Guido Sarducci via Tony Montana in Scarface; I half-expected him to introduce me to his little friend. As over the top as some of this could be, it fit nicely into the tenor of the project. However, not all of the performance shine. Wright seems drab and lifeless as Princess Buttercup; she's a decently-attractive woman (though I admit she doesn't do a lot for me) but her acting lacked any spirit. Although I like Wallace Shawn, something about his performance here was genuinely irritating. Granted, it was supposed to be that way, as his character is more-than-slightly arrogant and obnoxious. However, Shawn's work rubbed me the wrong way, and I really wish he'd toned down the schtick. Finally, Andr� the Giant fit his role in a physical sense, but the guy couldn't act to save his life (which may be why he's no longer with us). >From his stiff presence to his insanely-inarticulate speech - Andr� makes Mushmouth on Fat Albert sound like Olivier - the Giant is a bust. I guess when you need a huge dude for your movie, you don't have many choices, but Andr� reached his peak when he played Sasquatch on The Secret of Bigfoot. 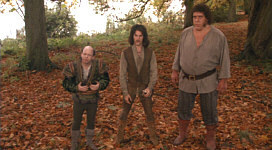 Despite some of those performances, the good outweighs the bad in The Princess Bride. It's a charming and delightful little film that offers a fun and generally inoffensive experience. 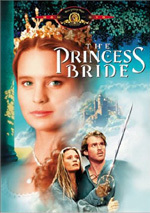 The Princess Bride appears in both its original theatrical aspect ratio of approximately 1.85:1 and in a fullscreen edition on this double-sided, single-layered DVD; the letterboxed image has not been enhanced for 16X9 televisions. Only the widescreen side was viewed for this article. While the movie looks very good for the most part, a few niggling flaws keep it from being genuinely fine. Sharpness generally seems pretty crisp and clear, but mild softness interferes with the image from time to time; this is nothing severe, but occasional shots were less well-defined than I'd like. Moir� effects and jagged edges were not an issue, but print flaws were a frequent nuisance. The picture displayed light grain on occasion, and I noticed a fair amount of gritty black speckles. Add in some white spots plus a few nicks and blotches and you have an image that appeared decent but was disappointingly dirty. Colors came across as wonderfully vivid and lush, however; the fairytale costumes look bold and bright and often provided some of the movie's most lovely images. Black levels were evident mainly through costumes as well, and they also appeared deep and rich. Shadow detail was a minor consideration but it seemed appropriate. All in all, TPB looks pretty good, but the mild softness and the moderate print flaws knock it down to a "B". Better is the film's surprisingly satisfying Dolby Digital 5.1 soundtrack. The soundfield seemed strongly oriented toward the forward channels. The surrounds appeared limited to some music and the occasional ambient effect; they worked especially nicely during the scenes that take place on ships, which offer some solid creaking sounds to accentuate the experience. Other than those exceptions, however, it's a forward affair, and a fairly good one at that. The front channels gave us a good stereo image that seemed relatively lively. The soundfield isn't exceptional, but it appears very acceptable for a film from 1987. Effects were consistently crisp and clear, with no audible distortion, and few times we witnessed some nice bass as well, such as during the trek through the Fire Swamp; when the flames burst, they did so with splendid emphasis. Best of the mix is the terrific reproduction of Mark Knopfler's score. It sounded clean and smooth and also came with some excellent low end; the dynamic range of the music seemed much better than I'd expect from a moderately old film. Although the limited scope of the soundtrack let me rate it no higher than a "B+", the fine quality of the audio will surely please. The biggest disappointment in regard to this DVD comes from its paucity of supplemental features. All we find are a trailer - one that gives away far too much of the story and the better gags, by the way, so don't watch it until after you view the movie - and a "collectible booklet". To be sure, MGM produce some of the best booklets in the business; check out the strong texts found with any of the Bond DVDs to see what I mean. The booklet with TPB is interesting but a bit weak. It took me 13 years to see The Princess Bride, but I'm glad I finally did so. I can't say that the movie dazzled me, but it seemed fun and creative and made for a very pleasant experience. The DVD presents generally good picture and sound, though it provides virtually no supplemental features. The film's legions of fans will be mostly happy with this DVD, though I think more ambivalent parties may want to rent it first. Footnote: A newer special edition of The Princess Bride now exists on DVD. The package provides a superior visual image plus a fine mix of extras. The only concern is that it comes with a list price that's $10 higher. I think fans of the film will be pleased enough with the improvements that it'll be worth the extra money.